Another Bose® 901 Series I Active Equalizer came through the shop recently for a full rebuild. These are all nearly 50 years old and are definitely showing their age, and this one was no exception – it came in with no output on one channel and definitely needed a full rebuild to get it going again. The Active Equalizer is responsible for shaping the audio signal to match the Direct/Reflecting driver’s frequency response, and without it, you’ll never get the good sound the 901 series is known for. This one was pretty dirty, but nothing some rubbing alcohol and elbow grease couldn’t majorly improve. Inside, most of the electrolytic capacitors had been replaced at one point in the late 1970s, but were still 30-40 years old and well beyond their design lifetime. The rest of the components were all original, including the unreliable small signal capacitors in the center. These original 2N5088s have color bands for their gain group on the back – all but one were identical. It looks like someone at the Bose® factory grabbed a wrong one during the original construction! Such a minor difference wouldn’t be noticeable to your ears, but might be able to be seen with sensitive test equipment, so it’s not a big deal. The transistors on this one came out and were replaced, since after the initial component replacement it still wasn’t quite right. One channel sounded great, but one channel had lower volume and suffered recessed mids which gave it an odd sound. Time for some troubleshooting! 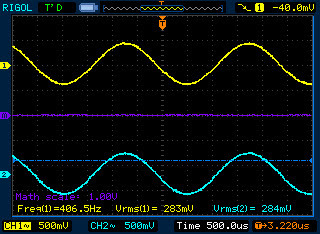 Using my oscilloscope, I compared channels to see where the signal got lost, using the built-in math functionality to show the difference between the two channels. 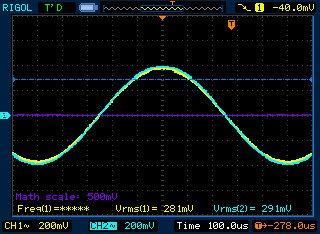 Ideally this difference should equal zero, a flat line, with both channels being identical. 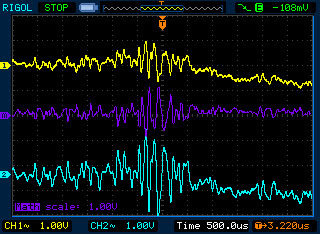 After further probing and testing at different frequencies, the difference and phase shift were frequency dependent. That pointed me towards the crossover and feedback circuitry, where it turned out that channel’s 22 mH inductor had gone open and was no longer giving the right curve shapes. Replacing both inductors fixed it right up! Problem solved! With that fixed up, I installed a new neon power lamp and boxed it up to go home, good as new. Fully refurbished, this one is going to serve well for a long time to come! If your Bose® Active Equalizer isn’t sounding like it should anymore, Rain City Audio can help. This entry was posted in Audio, Bose, Projects, Vintage and tagged Active Equalizer, Bose, Bose 901, capacitor replacement, vintage. Bookmark the permalink.